We did the 25s with a bucket and then took it off for the 50. It is a simple 1-gallon “paint bucket” from Home Depot. We string some paracord through the handle holes and then connect the bucket to a belt by a rope about 6 feet in length. The beats we use are recycled from old stretch cords. This set worked well today. The broken 200 was challenging but the :10 rest allowed them to hold their stroke technique. The interval on the broken 200 and 100 allowed them to really get up and go on the 3 x 25. We cycled through 2 rotations of this station and some drag sox work. Drag Sox Kick & GO!!! Most of the time on this blog, I publish single sets that we do within a larger workout. Today, I am publishing the entire workout how I have it written out for my group. You may need to zoom in a bit to see it well. 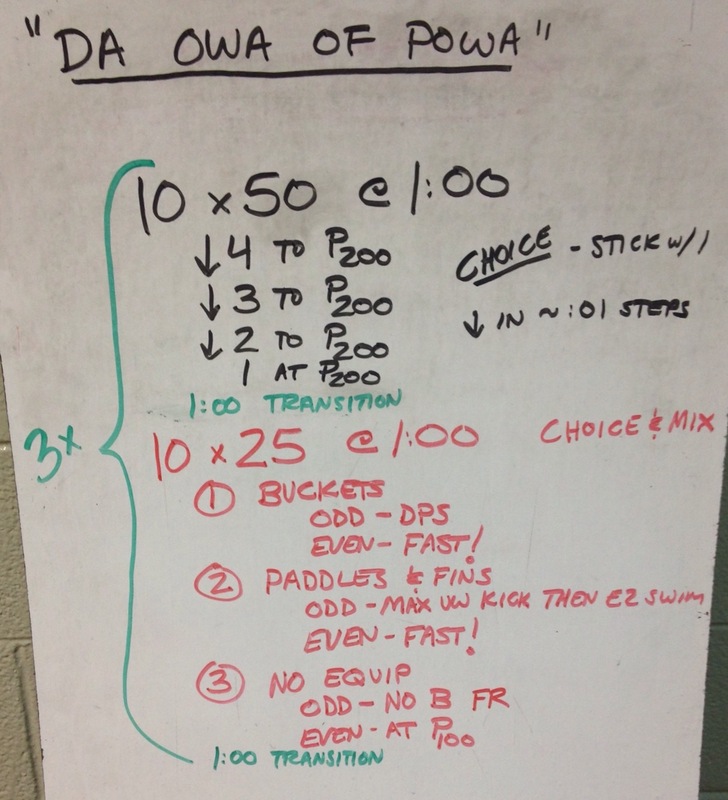 For this workout, we combined 3 power stations with a set of 6 x 50 off the blocks. We did it three times through, meaning each swimmer did each station once and the 6x 50s set three times. It was a good day for us — team energy and spirits were high, performances were good, and we spent time during our subsequent dryland discussing the previous weekend’s meet. Every swim was on a 1:00 interval. Everything is fast unless otherwise indicated. In a few cases, we had to add an extra 25 easy to get our swimmers back to the end of the pool with all of our equipment. Otherwise, this set worked really well. SCM. Editor’s note: This set first appeared on this blog on May 24, 2017. These two sets were stations that we performed in a diving well and a few adjacent LCM lanes. It was a good morning of speed and power. 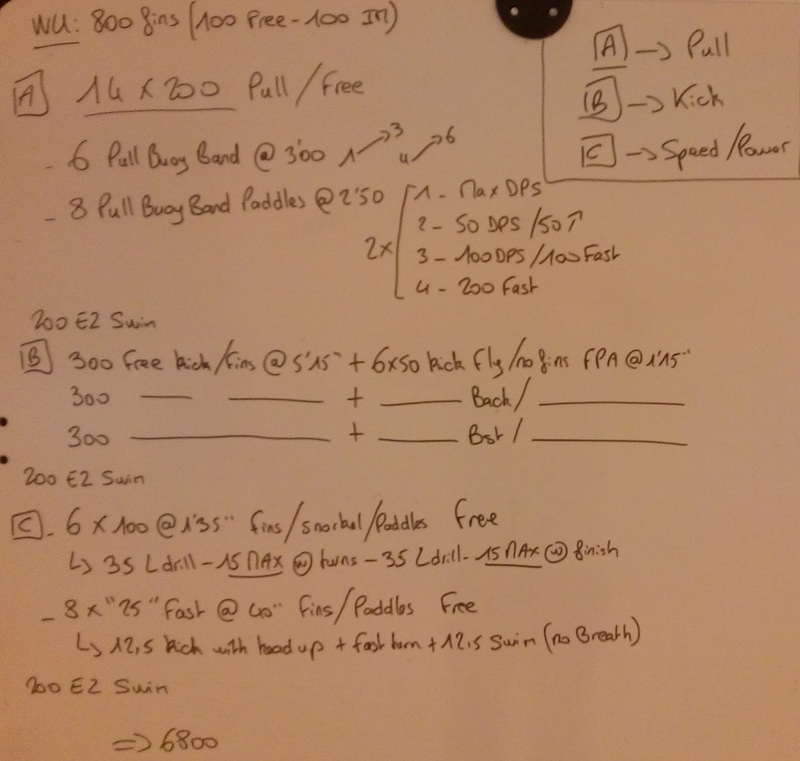 We did this workout after a 1600m warmup partially through our taper. Some “near-race-pace” swimming followed by a short buckets set just to keep the power in our strokes while we are coming down. We split the group into two in our five lanes. The half with the buckets used three lanes and the recovery/tennis ball half used the other two. With transitions between stations, this took about 55 minutes. Our club doesn’t have the luxury of having power towers to use (yet), so we substitute by having swimmers hold a stretch cord for the their teammates, giving them resistance for short sets such as the one below. One swimmer is tethered in the water and performs this set, and then they switch roles. No rest except where indicated. Powering through today with bags and buckets. Using video system (20 sec delay) to check our finishes after some power sprints on stretch cords. We did this set in our diving well which is about 12 yards across. We used the SwimmersBest Power Bags we reviewed earlier this spring. 4x through this for the IMers.